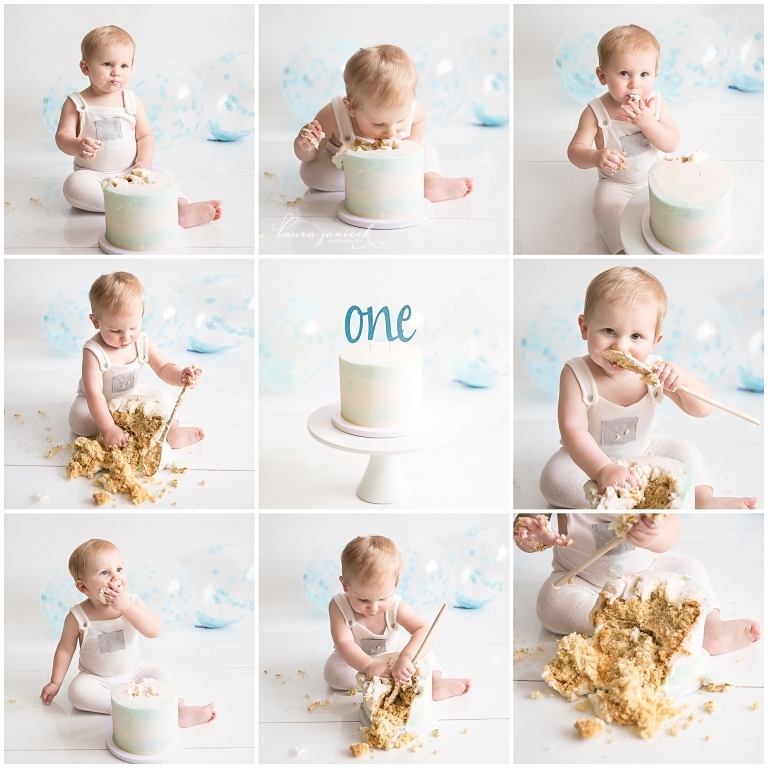 Cake smash photography sessions are such a fun way to help celebrate your baby’s big first birthday. You’ve made it through your first year together and your baby has accomplished so much in such a short time. This is his or her very first birthday celebration… ever! This is also likely your baby’s first (or second if the session takes place after their birthday) experience with cake and sugar in general. At what other point in our lives can we just dig into an entire cake with our hands and not worry about it getting it all over our faces and bellies (and often feet)!?! A cake smash is a super fun session to experience with your baby and to have captured with professional pictures. I have everything we need for a successful and super adorable session at my studio- cake stands, cake toppers, banners, balloons, hats/ crowns and even simple little (washable!) outfits. I also have plenty of wipes and paper towels to help clean up afterward. If your baby needs a little encouragement, I have puffs and cheerios that we often place on the edge of the cake to entice them to dig in!! I also have some wooden utensils to play with for those who are less then excited about getting their hands messy. All you need to bring to the photography session is your baby and a little smash cake! Babies tend to respond differently to the idea of the birthday cake. Some love it and go wild with it while others are more tentative. Either way, I make sure to get some amazing pictures to commemorate his or her big day. Once this little guy got a taste of his Ivey Cake (https://www.iveycake.com/) cake, I think he would have sat there all day!! As you can see, he loved digging into it with my wooden spoon too- typical boy! 😉 Anderson’s outfit is an example of one that was borrowed from the photography studio. SO cute and coordinates perfectly with our set-up. The balloons, cake stand and cake topper are also examples of the types of birthday supplies I keep on hand. I would love to help you celebrate YOUR little one’s first birthday with a cake smash! and serves the greater Nashville area.